As you can see on the “broken sheaves” picture he flanges on the sheaves for the traveller line on the Lewmar traveller car failed. 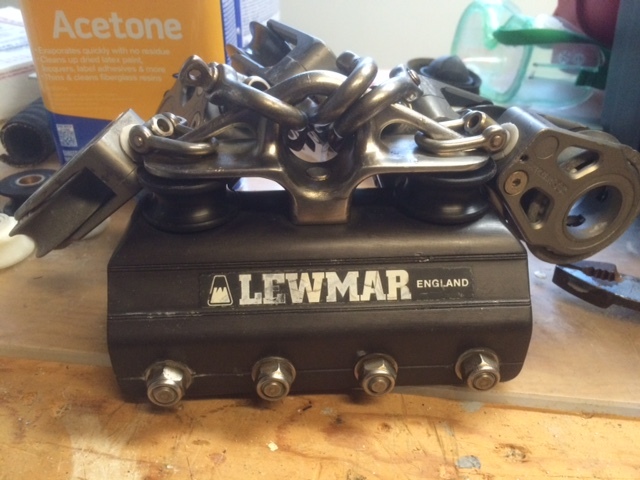 A call to the Lewmar representative in the USA found that Lewmar no longer supports this traveller design with spares or documentation. I was invited to buy and install a new traveller system. Through trial and error, good advice, and the loan of a hammer drill, I was able to remove the stop on one side and remove the car. You must remove the car to take it apart and remove the sheaves. To remove the end stop first remove the traveller block, then the two long 10mm flathead bolts that bolt the stop to the deck (hammer drill and bits), pry of the end cover and use a mallet to encourage the stop to come off the rail. 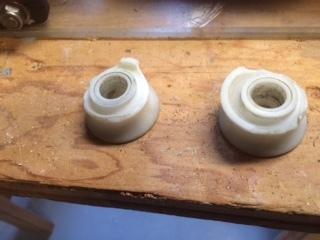 With the car in a vise you can then remove the two vertical bearing assemblies and twist apart off the top forging with the pins and sheaves. The next problem was replacement sheaves. I could not find the size required at the local marine supply or online. I did however find a reference to a shop called Zephyrwerks. This is a shop that machines custom sheaves run by Ed Louchard. Ed made a replacement set of parts and had them shipped to me in about a week at a very reasonable cost. I have reassembled the car with the new parts and it is now ready to go back on the boat. Contact information for Zephyrwerks is at www.zephyrwerks.com or Ed Louchard, edlouchard@gmail.com, 521 Snagstead Way, Port Townsend, WA 98368, USA, 360 385 2720.